This recipe is a first. It is the first time, I have no story or history behind a recipe. Seriously, have you ever known me to be short on words? Oh that frosting, yea, another happy accident. Same day as my Spicy Shredded Beef Sandwiches happy accident. Hmm...do you think either were REALLY accidents? HA! Preheat oven to 350 degrees. Line 8x8 baking pan with parchment paper or foil extending the sides 1 inch above the top of the baking pan for easy removal. Spray foil or parcheent paper with nonstick cooking spray. In a small pan melt butter and chocolate together. Stir constantly until melted and smooth, let cool and place in a mixing bowl. Add sugar, eggs, vanilla, and mint flavoring to the cooled chocolate. Mix until smooth and everything is incorporated. Mix flour and baking soda together and then add into mixture, stirring until well combined. Fold in mint chocolate chips. Pour into lined and greased baking pan and bake 30 minutes. Let cool before frosting! Melt butter and chocolate chips in the microwave, 30 seconds and then stir, just until all chocolate and butter are melted and smooth. Add in 1/4-1/3 cup of powdered sugar. Mix well, with beaters! Add in 1/8 tsp of mint flavoring. 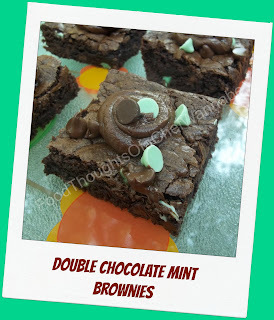 Using a piping back or a spoon dollop a bit of icing in the middle of each brownie. Top with a few chocolate mint chips! Oh crap, I forgot to tell you I kept a few chips aside and when I pulled the brownies out of the oven I sprinkled a few on top!